Blackheads are small pores which are present in the area where sebum is secreted in a significant amount. Mostly blackheads are visible on face, neck, and nose. They occur due to excess secretion of sebum from the sebaceous gland. The sebum reacts with oxygen from the air and gets oxidized and turns black. 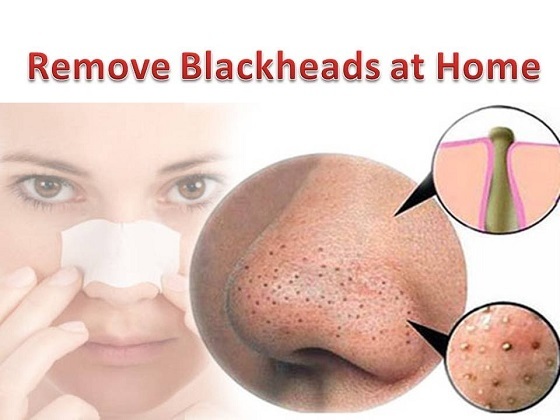 Various objects result in secretion of blackheads from the sebaceous glands. The sebaceous glands produce an excess amount of sebum. Hormonal changes often lead to blackheads and acne. During puberty, hormones trigger a lot. Dead skin cells can accumulate in the pores. Your pores become clogged, and the clogs lead to oil buildup. If you use oil-based cosmetics or moisturizers, they can also stimulate blackhead development. Talk to your doctor about the cosmetics that will work best for your skin. Heavy sweating or high humidity. Dietary factors, disease or medical reasons. Embarrassment and reduced self-esteem may affect as many as half of adolescents with blackheads. Skin irritation and pain resulting from blackheads can lead to problems with sleep. Cinnamon: Cinnamon is an anti-bacterial spice that can be used to make an aromatic face mask that offers all sorts of benefits to the skin, including the removal of blackheads. It also helps to eliminate flaky skin as well as acne, and it can be used as a body scrub for a smoother, more glowing complexion. Honey: Honey is both antibacterial and antiseptic, properties that help remove blackheads by destroying germs or impurities that clog pores, making it another excellent choice for those with acne-related blackheads.Honey also acts as a natural antibiotic, helping to pull dirt from the pores of the skin to clear blackheads as well as tightening and hydrating the pores for a clearer complexion. Heat about a tablespoon of pure raw honey in a small jar until it is warm to the touch (placing the jar of honey into a bowl of boiling water will do the trick). You can leave this treatment on overnight for even greater results, rinsing it off in the morning. Repeat daily. Mix a small amount of Kasturi turmeric with water or coconut oil to form a paste.